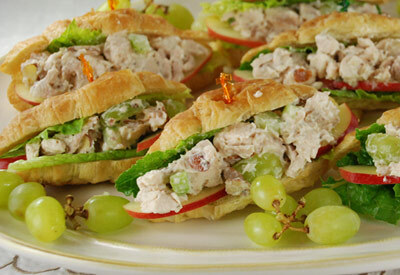 In a large mixing bowl combine chicken, grapes, celery, mayonnaise, yogurt, almonds, salt and pepper. Place sliced apples into a glass filled with lemon lime soda to prevent browning. Pat dry before placing in sandwich. Line inside of croissant with lettuce. Lay two slices of apple over lettuce (skin side facing out). Spoon equal amounts of chicken salad into each croissant. Secure with frilled toothpicks.